A window sticker is a helpful sales tool, illustrating everything your customers are getting for their money so you don’t have to memorize specifications in your sleep. WebManager includes a great tool for printing stickers to highlight key selling points in a clean, attractive design that car buyers can scan and save to their smartphones. Today, we’re going to go over four elements that make for a powerful window sticker, all of which can optionally be used in WebManager. In recent years, gas mileage has become one of the most important factors in buying a vehicle and it’s a trend that’s likely here to stay. A good window sticker doesn’t just list the standard city/highway figures, but puts into context what makes sense to the average shopper. 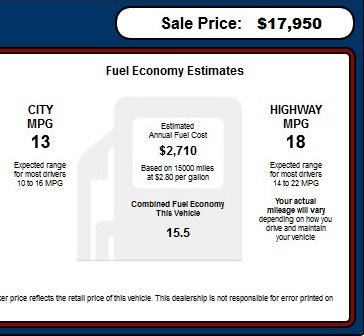 WebManager includes the industry average fuel economy range for comparison plus a calculation of the vehicle’s estimated annual fuel costs. If you’ve paid for a CARFAX or similar vehicle history report on the vehicle you want to sell, make sure you let shoppers know. Having prominent certification on a used car answers a lot of buyer skepticism by reducing the perceived risk of buying a lemon. Though you may not have time to customize the features list for every vehicle you sell, fully-featured models that have been sitting on the lot might benefit from some rewording. On these models, it’s unlikely that you’ll have enough room on your sticker to list every minor detail, so determine which features generate the most interest within the vehicle’s target demographic and move those features to the top. You might be able to cut out some minor engine specs on a minivan, for example, to to save valuable space. A QR Code is a black-and-white square filled with intricate patterns that vaguely looks like the world’s toughest hedge maze. When scanned by free smartphone apps like RedLaser, i-nigma or QR Droid, it opens up a web link that can point to pretty much anything hosted online such as a website, a sound file, a video, etc. WebManager gives you the option of putting a QR code onto your window sticker that links to the vehicle listing so customers can see the full specifications of each car they look at and save the page for future reference.